People ask why I volunteer to coordinate the fundraising efforts for Lost Mountain Middle School’s annual Rally Campaign called Rally 4 Quarters 4 Research. That answer is simple — I made a promise to a Rally Kid who asked me to keep fighting to find cures for childhood cancers. He told me that he wanted me to do this “…so other kids won’t have to suffer like I have.” That promise was to Rally Kid Tyler, who I taught in 6th grade during my first year teaching. The next year he was diagnosed with Ewing’s Sarcoma. He battled fiercely for many years. Tyler’s request, and my commitment to him, was made just three days before he died at the young age of 19, and I’m doing my best to live up to that promise. As a social studies educator, I volunteer my time to Rally’s efforts to model civics in action. Rally helps students learn about making sound economic decisions related to charitable efforts and about giving. 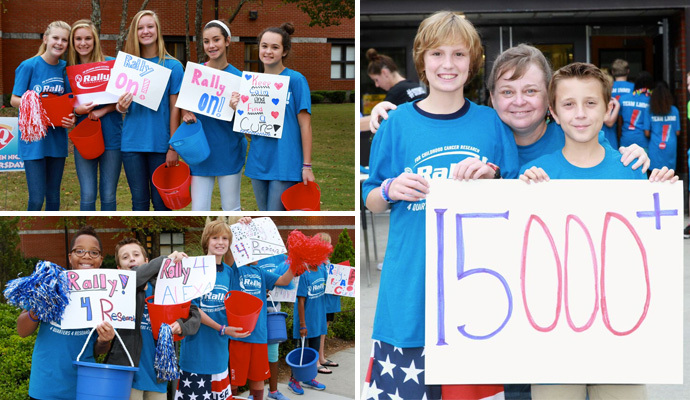 People also ask why Lost Mountain Middle School (LMMS) students volunteer by preparing for weeks and then fundraising an entire week to raise money for Rally and childhood cancer research. Well, the fight against childhood cancer is very personal to LMMS and has been for almost a decade. Sadly, Lost Mountain has more than 10 Rally Kids, kids who are fighting or have fought cancer, walk our halls since 2001. These Rally Kids had different types of childhood cancers and research is needed for each type. Our students have taken an enthusiastic lead in the fight for childhood cancer research. It has genuinely become a part of the culture of our school. As a social studies teacher, it is my fervent wish that childhood cancer will become history in these students’ lifetimes and that their volunteer efforts will have helped make that wish a reality. Join us in this quest and make a donation to Rally today.